A dropping water level in your pond could be caused by a hole or tear in the pond liner, which can easily be fixed with a repair kit, repair sealant, or by replacing the liner. Before considering repairing or replacing a pond liner, however, you should be certain it’s actually the liner that is leaking and not something else. Is The Leak My Pond Liner? A slow decrease in water level over weeks or months is unlikely to be a hole in your liner, but is more likely just natural evaporation occurring. This is especially true during warmer summer months, where pond water can become reduced in a matter of days due to the heat. With that said, even in the warmest months, you should only be noticing a very slight decrease in water level in terms of evaporation. A normal decrease of 1-2 inches of water per week is to be expected during summer, but this is usually replaced naturally with rainfall, so the pond water does not need manual topping up. If you have a waterfall or fountain running, and live in a very warm climate, you may see up to 8 inches of water loss to evaporation every week! This is because more water vapor is exposed to the air and heat for evaporation to occur, reducing the pond water level drastically. Evaporation should never cause a sudden decrease in water level over night, however, and anything over 2 inches in a 24 hour period is likely not being caused by evaporation. Other common causes of leaky ponds include improperly installed skimmer boxes, objects blocking waterfalls, or even hose leaks within your pond circuit. The only way to determine if these are the cause of the leakage is to physically inspect and monitor them during operation and check for leaks. A skimmer box needs to be carefully attached to the pond liner to prevent water leaking into the surrounding sediment, so it could be possible the liner around the skimmer is damaged. A waterfall that is being blocked may have water leaking over the sides of the display, possibly draining into your garden. Leaky hose pipes can cause a gradual lose of water, and could be anywhere in your pond, from pump to filter box. Check the water the following day, and if water has dropped drastically, you’re looking at a pond liner leak! The first step to repairing a leaky pond liner is to determine exactly where the leak is located, and the extent of the damage. The best way to find a pond liner leak is to simply let your water level drop until it reaches the point of escape, in which is will stop reducing. 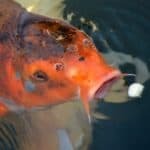 This is the most common and easiest way to find a liner leak, but if you have fish, you would need to add them to a holding tank just in case your leak is very deep in the pond. If the tear is right at the bottom of your liner, too much water will drain, making it insufficient to safely hold pond fish. After you have moved your fish to a holding environment, you just need to let your pond water sit and wait to see where the water stops dropping. The point the water level remains stable is very likely the area your pond leak is located. Once you have the level of the leak, you would need to do a search around the perimeter of the pond and tr to locate any hole or tear where water is escaping. If the hole is fairly large, you should be able to spot the problem area very quickly. If the hole is very small, you would need to look for signs of leaking, such as water flow to the area or small amounts of bubbling (water/air escaping). If you’re still having trouble finding the exact spot of the leak, you can refill your pond with a small amount of water just above the line of the tear. Then, you just add a small amount of condensed milk to the pond water. This will cause the milk, which is clearly visible, to be drawn towards the hole in the pond liner, making it much easier to spot. This is a fairly DIY solution to finding small leaks in pond liner, but it works very well. You only need an egg-cup amount of milk, and such a small volume will not harm your pond environment or fish. You can try this multiple times to determine the exact point of leakage, placing it in both the middle and along the edges of the pond. Should I repair or replace the liner? Once you have found the location of the leak, the next thing to determine is how you’re going to fix it. Small breaks in a pond liner are very easy to fix yourself, and there are several ways to patch them up. If the hole is much larger, or there is severe damage to the liner, it may be better to just replace the entire liner itself. Although this isn’t always easy (or cheap) for larger ponds, it can be a good solution for smaller pond builds, especially if the current liner is heavily worn, damaged, or continuously leaking. The size of the leak, the number of leaks present, and the overall damage done to the liner will determine what method is best suited. Below are explanations on the most common pond liner repair techniques, and what each one is best suited to repair. Our recommended choice of repair for both small and medium sized holes or tears in all types of pond liner. Pond liner repair kits come with everything you need to patch a pond liner leak, without the need to buy separate products or worry about material sizes. Repair kits generally come in the form of a pond liner patch, which needs to be secured over the leak in your pond liner. The repair patch is self sticking, and often comes with very strong, water-proof adhesive on the one side. Included also is a primer fluid for cleaning the area and a roller for removing air when the patch is added. To fit a repair patch, you will first need to locate the leak as explained in the instructions above. One the leak has been found you will need to determine the size of repair patch required, and if the repair kit is large enough. Often repair patches range in size from 2 x 2 inch to 30 x 30 inch. As a general rule, larger patches can be cut into a smaller patch, and they can also be used to patch multiple leaks in this way. If you’re ensure of the exact size, always buy bigger than needed to ensure no part of the tear is still open to water. Also, ALWAYS try to cut the patch in a circle shape for the best results, as square patch can fray at the corners over time. To install the patch, the pond water needs to be drained to the location of the leak. The area around the leak needs to be dried and cleaned thoroughly for the patch to stick and become water-tight. You will need to clean the area with the primer fluid included in the repair kit, which helps prepare the surface for the patch. After the area is cleaned, the repair patch is applied firmly to the leaking area and held in place. You then need to roll the patch with the included roller to secure it and remove any air trapped underneath. It will set after a few minutes and you can re-fill your pond water shortly afterwards. An alternative repair method to using a repair kit with patch is to use a water-proof pond sealant. Repair sealants are great for fixing small holes and tears in most liner materials, being able to fill in leaks from around 1-2 inches in width. The sealant pictured, Pond & Stone’s Great Stuff sealant is what we recommend due to its great sealing properties and fish safe design. To use the sealant you would need to first drain the pond to the level of the leak and dry the area around the tear. The sealant is then added directly to the tear using the attached screw nozzle which is fitted to the top of the can. The sealant will expand in size and cure over an 8 hour period before becoming 100% water-tight. After applying the sealant to the leak, you need to wait this amount of time before adding more water and topping up the pond. If the leak is very deep in your liner, make sure to place any fish in any holding container for the night while the sealant cures. The sealant is safe for plants and fish, so once firmly hardened, fish and water can be re-added together. This sealant is great for small tears in pond liners, but can also be used for leaking waterfalls or fountain heads. For example, if your waterfall is leaking on the one side and some of the flow is being lost, you can use this sealant to create a barrier to re-direct the flow into your pond. A second method to repair pond liner is with pond liner joining or seaming tape. Pond liner tape is used to attach to pond liners together, so it’s ideal for adding extra liner to the outer edges of ponds which may be leaking along the top of the embankment. It is also useful for adding more liner to equipment (eg., skimmers) which may not have been installed correctly, as well being useful to re-seal very small breaks and tears. If your leaking pond is due to a lack of liner on the outer edges, or you need to better secure the liner around equipment, joining tape should get the job done! To secure two liners together you will first need to prime the liner with a liquid primer and scrubbing brush. Afterwards, you can join using the double-sided joining type and leave to stand for a few hours before water contact. A more drastic solution for repairing a leaking pond liner is to just outright replace the liner itself. If the damage to the pond liner is extensive, or if the liner is very low quality, replacing it with a high quality liner may be the best solution long-term. This is probably overkill for ponds with small tears as a repair patch is likely all you would need. Replacing a pond liner will require the complete draining and cleaning of your pond, so it needs to be consideration before moving ahead. If you have pond fish, they will need to be relocated to a holding tank/pond while the new liner is installed and water cycled. The problem with leaky pond liners is we often have no idea how they occur! Since most modern pond liners are built to last, it’s unlikely general wear and tear have caused the problem in a newly installed pond. Most holes and tears in a pond liner are caused by some form of impact or pressure, whereas others may be just due to the degrading quality of a liner if it’s very old. Below we have listed some common things which can help prevent pond leaks and lengthen the lifespan of your pond liner. One of the easiest solutions for preventing pond liner damage, and one that is often overlooked, is by adding high quality netting to your pond. Pond netting is a great way to prevent debris from entering your pond and contributing to sludge buildup. Debris also may play a factor in the damage your pond liner sustains over its lifetime, as sharp debris, such as twigs, can cause a build up of micro-tears in the liner material. Gradually, areas where debris falls heavily can become weakened and will be more prone to tearing and leaks. On top of this, predatory birds, such as herons, are another common cause of pond liner damage. If you have fish in your pond and no netting, there is a high likelihood a heron has paid your pond a visit at one point in time. Herons are powerful birds, and sharp snaps from their beaks to catch fish can easily cause large rips in a liner material. Rubber liners are more protected from this threat compared to PVC, but even the heaviest duty rubber will wear down over time. A high quality netting will both greatly reduce debris, as well as help deter predatory animals from entering your pond water. They’re also very cheap, durable, and discreet against the ponds surface. Many pond owners choose to add rocks and pebbles to the bottom of their pond for a more natural aesthetic, but you should only ever use smooth, rounded stones. Pond water is constantly in motion, and any small rocks with sharp edges will be moving around on your pond floor. This can eventually lead to gradual tearing over time, and an overall weakening of the liner material. If you have stones in your pond, you can simply net them out and check to make sure none are sharp enough to cause trouble. If you’re considering adding rocks to your pond, we recommend those designed for safe pond usage, such as polished gravel stones. Pond liner leaks don’t have to be under the water, but can also be caused by splitting liner exposed at the edges of your pond. Most ponds will have their outer liner secured with stones, slabs, or natural rocks, which provides support for the outer edges and stops water leaking into the surrounding sediment. If you have installed a pond liner but some of the edges are exposed, consider securing them down or use joining tape to add more liner if you’re short. Pond underliner, or underlayment, is a material which is placed under your pond liner which provides support against the surrounding sediment. It’s often softer than pond liner, but still very durable, and helps prevent damage from objects both under and above the liner. If you’ve installed a pond without an underlayment, you’re at much higher risk of pond leaks. Pond underlayment is very important for maximizing the lifespan of your pond liner, and we always recommend it for new pond builds. If you’re considering replacing your pond liner in future, we advise to also invest in a quality underliner to minimize leaks, damage, and to ensure a longer pond liner lifespan. Repair kits and tapes can be bought online (e.g., Amazon, pond stores), at some DIY stores, or at specialized aquatic/pond outlets. If you have any local aquatic stores, they’re probably the most likely to actively stock things like this! Hi, I have just repaired my pond liner using filtrite vinyl repair kit, my tear was about 16 ” long it took a lot off patches and then one big one to cover the lot, I am a bit worried that this glue is harmful to my koi carp. We have waited for 5 days and now have a pump running , we have not put the fish in as yet could you tell me if it will be ok to put him back? Sorry for the delay. I’ve been away the last week and only just arrived back. That’s a pretty big tear! Do you know which brand of kit/glue you used for the repair? In most cases, so long as the repair kit is designed for pond-use, the glue should be safe after it has cured (usually around 48 hours after application). If it’s no longer sticky to touch, the pond should be ready for re-filling, but you could always contact the manufacturer to double-check if you’re still unsure. My pond is of size 130ft X 200 ft X 30 ft.The water level is slowly going down.I am sure it is not due to evaporation but has some damage somewhere.How to find the leak and how to fix it.The pond is full almost 25 Ft and hence can not drain out the water. Do you have fish in this pond? If not, you could look into water tracer dyes which are used to show the direction of water flow. If you do have fish, you may still be able to use a tracer dye, but I’d triple-check with the manufacturer to ensure it’s non-toxic to domesticated fish and wildlife. I have a small whole in my pod liner that is causing half my pond to drain over night. My biggest problem is its 20 degrees or below, freezing the liner and making it brittle, and if not careful when cleaning it cause the crack to get larger. Do I apply a patch or foam? Ps. I do have fish and I’m afraid to move them in the cold temps. They have about 2.5 feet of water for now and seem to be ok..
Where is the location of the hole? Can you physically reach it to patch it or would you need to wade into the pond? So long as it’s not on the bottom of the pond, I’d slowly drain the water to the hole, dry/clean the area, and apply a repair patch (or cut strip of extra pond liner) and let it set with the appropriate adhesive. Alternatively, if the hole is very small, yes, you could use sealant to fill in the hole but this would still need time to set (in most cases, a repair patch is more ideal).